The 2012 Tustin Chili Cook-off Preview! Ever wonder what goes into preparing enough chili to enter a chili cook-off or how the cook-off works? Well, let me tell you! Last year was our first entry and even though I was 8.5 months pregnant, I still managed to have a good enough time to want to do it again this year. This year, the event is Sunday June 3rd. Preparation for making the chili this year is going to be easier since I already have SOME experience tucked under my belt, plus we have most of the gear we need. We bought a propane burner and a few huge pots. What we will need to buy is the Tri-tip – LOTS of it! 52 pounds to be exact. Last year, it took two weeks to brine, season and slow cook that much meat at Rancho Meade. After the Tri-tip is cooked, it gets shredded and stored in 8-pound batches. Seasoning gets portioned into packets. This way, each batch of chili is prepared, fully cooked and properly chilled a few days before the event which gives it time to develop the flavors. Also, doing it this way, I know thE food has been cooked fully and nobody is going to get sick. 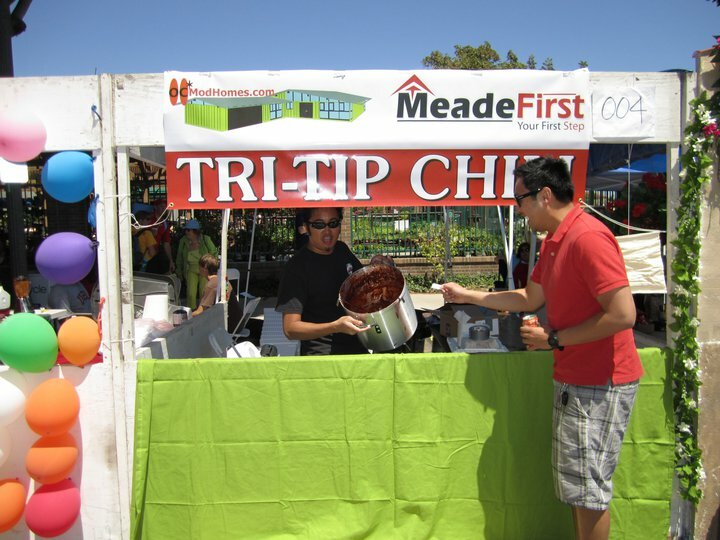 Once we’re on site, the chili is brought to the event in ice-packed coolers and heated one batch at a time to be brought up to temperature and served HOT to our customers. Last year, we were sold out in two hours and had a constant line at least five people deep. Make sure you get there early if you want to give ours a try. The opening ceremony commences at 11:00AM. Last year, we were located across the street from Ivy’s Bridge and Beach Pit BBQ (now Tustin Roadhouse) on El Camino Real. This was a great spot because it’s not as crowded, has easy access, and is close to the beer booth. We hope to get the same spot this year. Look for us! Admission is free and chili costs just one ticket. Tickets can be purchased at the event for $1.00 each. Beer is $5.00 to $6.00 each, which is different from last year because it looks like they are taking cash instead of tickets for beer. Parking can be tricky, but if you live in Tustin, chances are you can easily walk from home. If you’re driving in, the biggest parking area is at Civic Center (300 Centennial Way). We usually get street parking on Sixth street.